Detailed tuning, when correctly simulated in the game, provides a means to automatically implement all the effects inherent to flight – effects such as rotor spin from oncoming airflow, tail-spin, drag force in a dive and so on. The following simulation improvements also provide a means to make aircraft tuning easier, since even if there is insufficient information available about a given aircraft, we still have the ability to simulate its in-game behavior, which will be as close as possible to its real-life prototype when all the aircraft's known parameters are provided.Our simulation provides a means to calculate, in real time, any changing parameters during flight – for example, a reduction in weight after dropping a bomb, fuel expenditure or changes in the flight model due to damage to the wing, flaps or stabilizers. Apart from this, it also allows effects from modifications to be realized. Since we are constantly working on improving our environmental simulation (for example, as soon as the game went into open testing we added the influence of flow angularity on the stabilizers, a more accurate propeller model and the influence of near-mach speeds) and on improving the accuracy of the models themselves, this often implies performing ongoing work on each aircraft after changes are made to it. This leads to a requirement for faster and more precise testing for every altered flight model. At the same time, we're upgrading our analytical calculation tools, developing additional means to improve our flight model settings, and coming up with new ways of testing using tools such as simulating an aircraft fly-out in an in-game environment. As of now, we've reached a point at which the results of our automatic testing fully corresponds to in-game testing while displaying basic flight characteristics. On the other hand, automatic tests cannot portray every detail of controlling an aircraft. We now use the principle of triple-checking all our models before altering them and introducing them to the game. For example, in the past we created a model of one of the Beaufighters – both our automatic tests showed that the aircraft behaved just as it should. There were no calculation errors. However, when we started testing the aircraft in the game itself, it became clear that people could not achieve the same results that our automated tests achieved. The problem lay in the fact that an automatic test has the ability to operate the engines and control the aircraft perfectly, but the aircraft control scheme was far more complex than it was in real life – players simply couldn't achieve the same results that our bot could. In the end, the flight model required significant re-development to correct the aircraft's behavior. Manual testing performed by a separate flight model testing group. Comparison of all received data with reference data. All the basic figures are checked using automatic testing – maximum speed at various heights, turn time, stalling speed, roll rate and so forth. 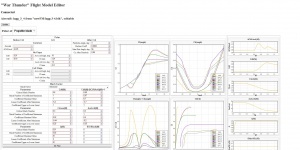 Analytical calculations are much faster, which allows us to quickly check basic parameters during configuration, while simulation is more accurate, but takes more time to calculate. At the same time, the adjuster has the ability to switch various aircraft parameters – to set altitude, the aircraft's load, its speed and engine modes, maneuvering lever positions and so on. The aim of manual testing is both to check the aircraft's behavior and maneuverability and to test this data as, for example, the angle of attack – things which are very hard to determine automatically. The data received during all these tests must correspond to reference data in order for the flight model to be introduced into the game. 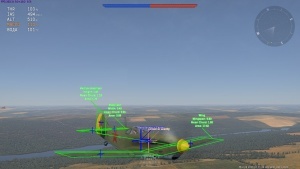 War Thunder's flight model editor. Here the wing section is opened for edit. LaGG-3-4's propeller characteristics section. Settings for critical speed behaviours. Propeller blade geometry (and therefore physical behaviour) tuning for the LaGG-3-4. On the right immidiate visualized feedback. Most of the time spent on tuning flight models is spent searching for and studying as much documentation as possible on the aircraft, and also determining the reliability of those documents and how well they correlate. For various tests and examinations, factory data often differs significantly in the most basic parameters, and for some aircraft, it can be very difficult to find any reliable information at all. For example, when we were tuning the Australian Boomerang, which is present in our game as a premium vehicle in the British tree, we not only had to deal with insufficient documentation and tests for the aircraft (or rather, none at all), but even a contradictory report! In studying the report (54/46/8), several things appeared strange even at first glance: the engine that was installed on this aircraft was familiar to us (Pratt and Whitney Twin Wasp R1830) and we knew its capabilities – we’d even configured several aircraft with this engine before – but according to the report, on the Boomerang it didn’t work at all like we would have expected. The compressor switching altitude surprised us – it wasn’t what you’d expect from this aircraft. The ascent speeds were also strange (not at all the speeds that were indicated in the flight manual) – when we copied the characteristics of an already existing and operational engine in the game and wrote in all the aircraft’s remaining characteristics, the aircraft flew significantly better than the report indicated (at supercharger speed two). According to the report, the supercharger speed switched over at entirely the wrong height ranges (too high by several thousand feet) compared to the usual behavior of this engine (or family of engines), and at supercharger speed two it was slower than at supercharger speed one. This actually can happen (very rarely) with aircraft that were designed to fly at low altitudes, but the Boomerang is a fighter! All our calculations also showed that the characteristics from the report could not be correct. After many attempts to repeat the strange and inconsistent supercharger behavior, we came to the conclusion that the aircraft prototype that was tested most likely flew with a defective compressor which provided insufficient air pressure at speed two. There are references to the defect in the report itself. After a long discussion of the situation, we took the decision to “install” a “corrected” engine on the aircraft. The result is that the Boomerang in the game shares all the aircraft’s real physical characteristics, but flies far better than the prototype for which that very report was made. Because of this, its statistics are entirely estimated. A similar situation occurred with the Soviet La-7-B20, where a similarly tested aircraft also had supercharger problems. To speed up the tuning process and increase the convenience of testing flight models, we introduced an internal aircraft passport system. We find information about the aircraft (sometimes with the help of players), compare the documents, calculate the most reliable of them and transfer all the data we need into a separate database, which we then use to tune and test the aircraft. An excellent example of how significantly official reports on the statistics of a given aircraft can differ from each other is the story of configuring the Bf-109F-4. In the beginning, we obtained several documents (from November 1941 to July 1942) written in Germany and drastically different from each other. 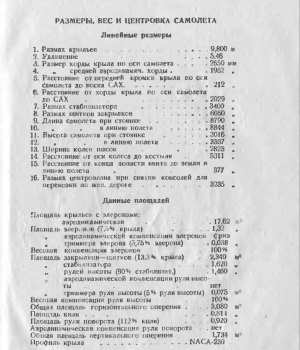 Moreover, several reports on tests carried out on captured aircrafts by the Soviets made for an even greater data variance. The characteristics in these reports were very different from each other. One of the reports set the aircraft’s maximum speed at 670 km/h, and another at 630 km/h, the first higher and the second lower than the speed that BF themselves reported. It was clear that we needed to search for the truth in one of the documents, and that the aircraft had been tested in different conditions and with different modifications, but we didn’t know which one of them was the “true combat” model and which ones were modified. We discovered that one of the reports was produced on an aircraft which had been completely reworked – all its armament had been taken off and a huge amount of work had been done on sealing and finishing the fuselage and wings. The other was most likely damaged; its speed metrics were considerably lower than those in the other sources. The third report was the closest to both our preliminary calculations and the factory data – this was the report that we decided to base our flight model calculations on in the end. 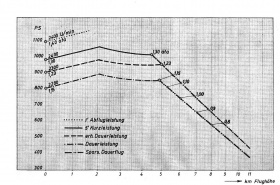 Example of geometric and balancing characteristics in documents and in the game: Historic drag curve of the IL-10. 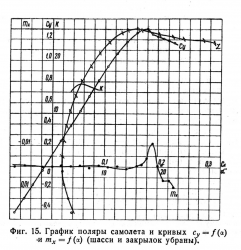 Graphs Cy and L (Suetterlin letters were used for Vectors & Tensors until early 20th century) are also shown below. 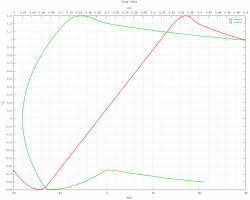 Example of geometric and balancing characteristics in documents and in the game: Drag curve ingame for Il-10. As the scaling is different Cy and Cd look further apart then they are on the historic sheet. Geometric characteristics for each of the aircraft’s parts, including the area and span of the wings, fuselage and vertical and horizontal stabilizers. Both the size and the angle of the propeller blades are taken into account. Most of the information on the various geometric sizes can be found in the aircraft’s technical description and other technical literature. The parts of the aircraft for which such information is unavailable can be calculated using blueprints. Sometimes, some parts even have to be calculated using photographs. All our geometric characteristics correspond to the prototype model. Weight and balancing characteristics – the weight of individual parts of the aircraft, from the fuel and ammunition to the aerodynamic surfaces, armored backrest, landing gear and the weight distribution of fuel between the different fuel tanks. This data is usually available in the literature we have and also corresponds to the real-life prototype. Aerodynamic characteristics – the drag curve for all surfaces, parameters of the fuselage, radiator and landing gear, the installation angles of all the aerodynamic surfaces and the V-tail and aerodynamic focuses. This data is not always available in documents, and when it turns out to be impossible to find it, we use available data to calculate it. Maximum speed and G-forces. Often available in documentation. For each engine, we set its power characteristics, turbo-compressor or compressor parameters and thermodynamic characteristics (set using documented information about the acceptable use duration for each engine mode – at this time we use a simplified thermodynamics module, but in the near future we will move on to deeper and more accurate modeling). We also set the propeller parameters such as spin, thickness, blade drag curve, the number of blades, their span and weight, the type of speed governor, angles of displacement, WEP parameters – additional fuel requirements, for example the injection of water, methanol or nitrogen dioxide, the parameters of the speed governor for WEP and power increase. Much of this data is directly indicated in documentation. The effectiveness of maneuverable surfaces – the rudder, elevator and ailerons. This is rarely found in documentation and often must be calculated using the aircraft’s behavior at various speeds. The 1.4 ata take-off engine pressure is indicated with dots (···) at the top. Travel settings are at 1.23 ata and is indicated via the perforated line (- - -). Comapred to the German engine document this sheet is flipped. Red line is take-off and the black one is cruise engine settings. 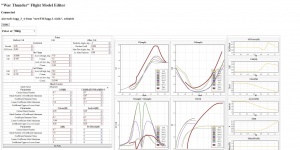 After tuning, additional testing is performed on all available data which we integrated into the special passport, introduced within tools, and received in the game during simulation. All the data must correlate in order for the flight model to be confirmed for further testing. 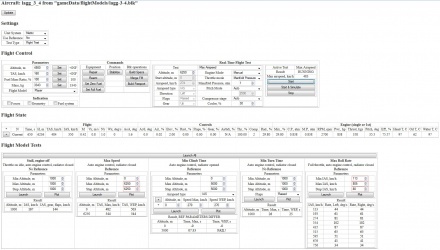 This approach allows us to avoid situations in which a flight model might have flown as it should in manual tests, exhibiting data close to real data, but in fact has huge internal errors such as a different weight, which doesn’t seriously affect a usual flight, but leads to inaccurate behavior in certain situations. Finding and studying documentation, determining reliable data. Creating an internal “aircraft passport”. Calculating required parameters using known data. Introducing the values into the flight model. Thoroughly testing the model – all the values from all the tests and those indicated in the aircraft passport must coincide. If data differs from reference data by over 1%, further refinement work is performed on the model. This page was last edited on 7 September 2018, at 06:27.